All Good and Wise Advisors, Happy New Year! Like Professor Tsu, I would like to wish all of you a Happy Chinese New Year in advance! We say, "Happy New Year!" Should we be happy in the old year? We ought to be happy year after year, month after month, day after day, and moment after moment. Why should we be happy? Happiness does not mean we eat some delicious food and feel happy. Nor does it mean we wear nice clothes, and that makes us happy. Nor is it that we buy a fancy car, or live in a fine house, and that makes us happy. How should we be happy? In our own natures, we should always be content. As it is said, "Knowing contentment, one is always happy. Able to be patient, one is naturally at peace." We should always be content. In every moment and at all times, we ought to be content. We human beings have more wisdom and more spiritual awareness than animals. We surpass them in every respect. For that reason, we should be content. If we are content, we will be happy and without afflictions. So not only should we be happy when celebrating the new year, we should be happy and free of afflictions all the time. That way, we can "cultivate the ground of the mind and nurture the sky of the nature." If you can make the ground of your mind bright, and the sky of your nature bright, this brightness is the brightness of the Buddha. Why haven't we manifested this brightness? It's because we have not truly been able to "cultivate the ground of the mind and nurture the sky of the nature." 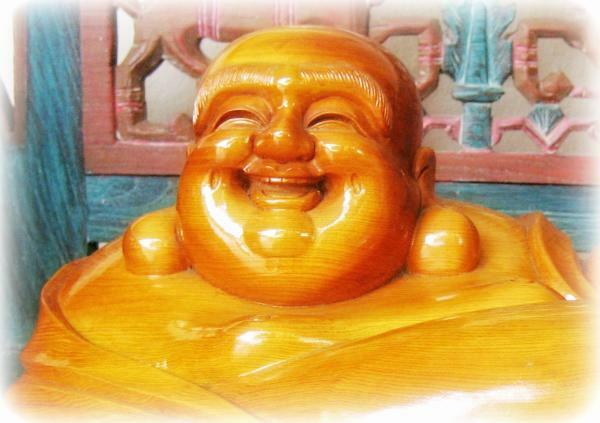 Therefore, according to Buddhism, if you can be happy all the time, just this is cultivation. In Vegetable Root Discourses, it says, "With the brilliant wind and unclouded moon, the grass and trees are delighted." At this time, there is a gentle breeze, a clear moon, and few clouds. The grass and trees all thrive and flourish, feeling very joyful. What about "the furious rain and strong wind"? If heaven gets angry, it rains heavily. The falling rain symbolizes heaven's tears; heaven is feeling sad. The strong wind refers to a hurricane. When a hurricane blows in, not to mention people, even the birds and beasts are distressed and unhappy. So it says, "With the brilliant wind and unclouded moon, the grass and trees are delighted. With the furious rain and strong wind, the birds and beasts are woeful." Therefore, heaven and earth cannot exist for a day without harmony. A person's heart cannot be for a moment without happiness. If there are rainstorms and gusty winds, then heaven and earth are not in harmony. "Heaven and earth cannot exist for a day without harmony." There should always be a gentle breeze and an auspicious energy. "A person's heart cannot be for a moment without happiness." In our hearts, we should be happy and joyous all the time. 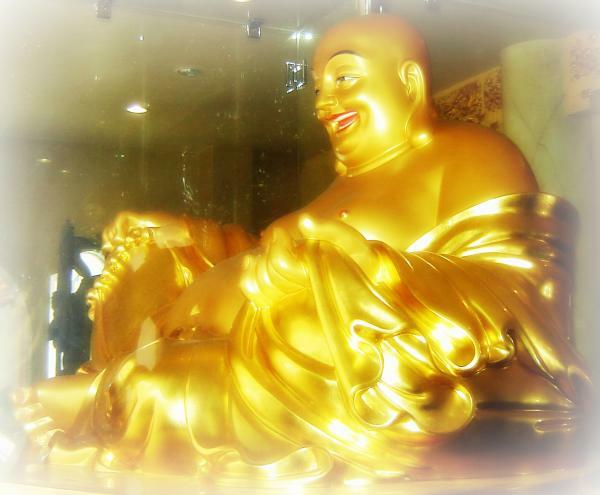 We should be like Maitreya Bodhisattva, who never becomes afflicted, no matter how people treat him. He said, "The Old Fool wears a patched cloak." I am a dumb old man who doesn't know anything. The clothes I wear are patched up rags. "He fills his belly with tasteless food." "It is all right if I can get full with simple meals," he says. So he often pats his big belly and says, "See how full I am!" "He mends his clothes to keep out the cold." When my clothes are torn, I mend them. "And lets the myriad things go by." When things come up, he responds; when things are gone, he is still. He handles the myriad things according to their conditions. "If someone scolds the Old Fool..." If someone scolds him, "You old freak!" "The Old Fool just says, ‘Fine!’" This old fool will just say, "Good, good. It's great that you're scolding me." "If someone beats the Old Fool, he falls down and goes to sleep." If someone beats me, I lie there and take the beating, as if I were asleep. "If someone spits on his face, he lets it dry by itself." If you spit saliva on my face, I let it dry up by itself. I won't wipe it off. How is it? "That way, he saves his strength, and you don't get afflicted." I save the energy of having to wipe it off. When you see that I do not react or try to spit back at you, you don't be afflicted either. "This kind of Paramita is the jewel within the wonderful." Ordinary people do not know how to apply this Paramita, this way to get to the other shore. This is the wonderful of the wonderful, the treasure of the treasures. "If you know this news, why worry about not realizing the Way?" If you know this principle, how could you not accomplish the Way? You will surely accomplish the Way! Professor Tsu was talking about compassion and about humaneness in China's Confucianism. Actually Confucianism advocates loyalty and forgiveness. Catholicism and Protestantism talk about universal love. The Chinese character 博 "universal" has a vertical heart (mind) radical 忄, and the character 愛 "love" also has a heart 心 in the middle. Love is in the heart. Taoism talks about influence and response. Although it advocates "purity and nondoing" and cultivating the way of Nature, wherein "People emulate the earth, the earth emulates heaven, heaven emulates the Way, and the Way emulates Nature," as quoted in the Daodejing (Classic of the Way and Virtue), the teaching of Taoism focuses on influence and response. Buddhism promotes kindness and compassion. These three religions--Confucianism, Buddhism, and Taoism--are not beyond the mind. Apart from the mind, there is no religion. Confucianism advocates loyalty and forgiveness. Loyalty means to conduct ourselves honestly. Forgiveness means to be forgiving of others. To conduct ourselves honestly means that, in whatever we do, we should be faithful to others. We should do our best to be loyal. This is basic to cultivating our character and virtue. To be forgiving of others means to pardon others. If they make mistakes, forgive them, and be tolerant. If you can conduct yourself honestly, your character will be pure and noble. If you can forgive others, you will benefit others and not pick on them. This is the teaching of Confucianism, which is not beyond the mind. The Chinese characters for "loyalty" 忠 and "forgiveness" 恕 both have a mind radical at the bottom. In Taoism, everything depends on influence and response. What is meant by influence? It means, "With influence, there is a connection." What is meant by response? It means, "There is a response to every prayer." Anyone who prays will get his prayers answered. This is describing the interchange in the Way between influence and response. What is meant by influence and response? Take the example of an electric current. When the electricity is hooked up somewhere, there can be light. This is what is meant by: "With influence, there is a connection. There is a response to every prayer." It also means that others can know what you are thinking. There is mutual influence and response between people, like an electric current running between their minds. Whatever you seek, you will get. If you are really sincere, you will have influence and be able to connect with the gods and spirits. Taoism talks about influence and response, and thus Laozi wrote the "Essay on Influence and Response," which begins, "The Elder Superior One says: Blessings and calamities have no door, but people bring them upon themselves." That is influence and response. There is no door for blessings and calamities to enter through. If you do good deeds, you will have blessings. If you do evil, you will suffer calamities. "The retribution for good and evil follows one like a shadow." The rewards for good deeds and retributions for bad deeds are just like the shadow of your body, which follows you everywhere. Wherever you go, your shadow goes along with you. Thus heaven and earth have gods in charge of offenses. Heaven and earth have four gods in charge of the year, month, day, and hour, respectively. There are always gods and spirits quietly and invisibly supervising everything. "Thus heaven and earth have gods in charge of offenses. They reduce people's allotted life spans according to the gravity of their offenses. When one's life span is reduced, one meets up with poverty and waste." To reduce people's life spans means to shorten their lives. One ji 紀 is a period of twelve years, and we speak of reducing life spans in terms of ji. With your life span shortened, you will also become poor, and you'll suffer all kinds of misfortunes, accidents, sicknesses, and bad reputation. The "Essay on Influence and Response" says, "With influence, there is a connection. There is a response to every prayer." Therefore, Taoism talks about influence and response. Buddhism talks about kindness and compassion. What is kindness? It means being kind to those with whom one has no affinity. That is, you should be kind and compassionate to people who feel no affinity with you, no matter how they treat you. It is especially when there is no affinity that we must be kind to people. This is kindness for those without affinities.